in the life of one of America’s most beloved cities. 10th anniversary edition ISBN: 978-0967820446; $24.95, Published September 2009. Distributed by Ingram, Partners West, Baker and Taylor, and American West Books.
" This splendidly rich composition should serve as a model for other communities seeking to understand how they have developed and who they are." Ex-Berkeley Mayor Shirley Dean, "Mr. Schwartz has put together a must-read book"
Dr. Charles Wollenberg, Professor of History, Vista College, "A vivid picture...a fascinating bottom-up view of Berkeley during the most important decade of its history. "Berkeley 1900 is the first book to approach a true history of day-to-day life in the neighborhoods at the turn of the century,"
"In recent years, a complete interpretation of our past has come to be defined less in terms of famous people and momentous happenings and more through an examination of the lives of ordinary people and everyday events. In his 10th anniversary edition of Berkeley 1900, Richard Schwartz displays once again a pure gift for taking this interpretation to new heights. From a stack of moldy and discarded Berkeley Daily Gazette newspapers, he has discovered unmined snippets of history to tell his story. He has rediscovered people and events long lost in the cracks of time. Each page of Berkeley 1900 is filled with charming, amusing, factual, poignant and always revealing articles showing how life was, how it has changed and how it remains the same. An example of how life was: When was the last time you drank a glass of Baldwin's Celery Soda, guarenteed to cure sick and nervous headaches seasickness and mental fatigue. A choice example of how some things never change: An article under the catchy headline "Dandy Dresser Decamps" tells about one James Graham who dissappeared from Berkeley last week, leaving a 17-year old wife and a long list of creditors. Policeman Barff today arrested a foxhound on a charge of petit larceny. The dog was a hound pup which was caught stealing doughnuts from the Capital lunch counter on University near Shattuck and was taken by the officer to the police station. Later it was learned that the dog belonged to Gladstone Morris, residing at 2229 vine Street, and when notified of the trouble into which the dog had gotten himself, Morris agreed to pay for the doughnuts if the dog were turned loose. The dog was permitted to go home. 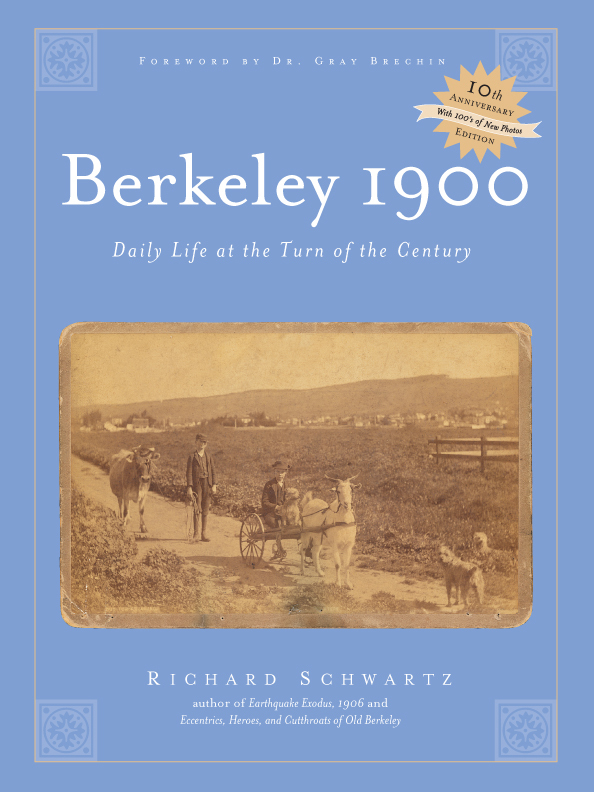 In this expanded 10th anniversary edition of Berkeley 1900, Richard Schwartz has succeeded once again in producing both accurate history and a good read. Buy the book. It's a winner." SOME OF THE best histories have been written by amateurs, including Thucydides, Edward Gibbon and, in our own time, Barbara Tuchman, Shelby Foote and David McCullough. Richard Schwartz is another one. He isn't a history professor; he's a building contractor. But one day in 1996 he happened to be visiting the Berkeley Historical Society when he spotted a two-foot stack of old Berkeley Daily Gazette newspapers from 1900 to 1909 that somebody had donated. The Historical Society was about to throw them out because they were moldy, and nobody wanted to run the risk of the mold spreading to other collections. "Hey, I'll take them," he said. And the rest — if you'll pardon the expression — is history. These newspapers became the genesis of his first book, "Berkeley 1900: Daily Life at the Turn of the Century," published in 2000. Befitting his daytime job as a contractor, he sold it not only in local bookstores, but also in hardware stores. It was an immediate hit, and no wonder. Who could resist crime stories like this one? "Too much indulgence in whiskey last night proved to be the undoing of one of the must successful juvenile robber bands that has infested Berkeley for some time. As a result, the gang is broken up and five small boys — Willie Small, aged 8, James Small, aged 9; Fred McNamara, aged 10; John McNamara; aged 13; and Gustav Palache, aged 13; have been made to feel the stern rebuke of the law." "Perhaps because she feared to undergo the dreaded tuberculin test, or perhaps because her bovine lover no longer smiled at her, a cow of this city committed suicide a few days ago by eating a can of green paint." Within three weeks, the entire first printing of 2,000 copies sold out. So he printed 8,000 more. And they quickly sold out, too. People kept bugging him to print more, but he couldn't because there was no room for them in his garage, where he was also storing copies of his second and third books, "Earthquake Exodus 1906: Berkeley Responds to the San Francisco Refugees" (2005) and "Eccentrics, Heroes and Cutthroats of Old Berkeley" (2007). But in the 10 years since "Berkeley 1900" was published, people have been coming out of the woodwork with their old family photos, diaries, letters and other artifacts. Schwartz has incorporated them into an expanded 10th anniversary edition, with hundreds of new pictures and stories. "Mr. and Mrs. W.T. Mushet of 1831 Derby Street left Berkeley two weeks ago with their four children for a trip to Santa Cruz. On the way down on the train there was a child suffering from diphtheria and, by the time the family arrived in Santa Cruz, the four children had taken ill. Two of them have recovered, but two have passed away. Muriel was six years old and Douglas five." This isn't stuff you'll find in history textbooks, but it's history just the same — and a lot more fun. "Berkeley 1900" is available in a bookstore — or hardware store — near you. Reach Martin Snapp at catman@sfo.com. Schwartz, who is originally from Philadelphia and moved to Berkeley after he got out of college in 1973, recalled the “happenstance” way in which the book came about. Author of a single previous book, The Circle of Stones, about a mysterious stone circle in Stampede Valley in the Sierra Nevada, Schwartz began visiting the Berkeley Historical Society, “riveted” by the film of a turn-of-the-century streetcar. Schwartz ruminated on the themes that spring from the old stories and photos. Schwartz spoke of recurring details he found poignant: “many people, especially immigrants, carried notes around with them, in their back pockets, so if they died, they wouldn’t be buried in the wrong place ... and you realize this place was loaded with animals. An article tells how a bear was spotted in 1905 near the reservoir up by Spruce Street—and in a pioneer family album, I found a picture of a bear on a chain, on Spruce Street. The same bear? RICHARD SCHWARTZ'S day job is building houses, but his passion is local history, especially Berkeley history around the turn of the last century. He loves that particular time period in his adopted home so much that he has now returned to it again and updated his "Berkeley 1900" book, adding what he says are hundreds of new photos, many of which have never been published before. It was 10 years ago that he published the first edition of "Berkeley 1900." This second one follows the format of the first, interspersing photos with actual news stories out of the Berkeley Daily Gazette from 1900 to 1909, except that this second volume has more photos. The Gazette story headlined "Gypsies Quarrel in Camp" now has a picture of Bay Area Gypsy women and their children near their tents. Not all the photos are sharp and clear. Some are quite muddled, but they are all fascinating. "Bad blood between two hostile gypsy camps in West Berkeley has sprung up over the retention of two gypsy maidens, who in addition to their beauty are successful fortune tellers and, hence, greatly desirable members of a well-conducted gypsy band." decided that he and his police force would keep a "close watch "... over the sulky foreigners to prevent any serious consequence of the quarrel." A couple of weeks later, the Gazette published an account that permanent residents of the area had signed petitions asking for the ouster of the Gypsy camps. "Marshal Vollmer stated that he had already attempted to drive the gypsies away, but found that they held a lease on the property, which does not expire until September 8. Although they pay but $4 a month for the use of the property, it would nevertheless be difficult to drive them off until the lease expires." The Gypsies apparently did not leave Sept. 8, because the Gazette printed a story Sept. 22 about "the female contingent of the band." Police arrested a Gypsy woman for spitting on a ferryboat. She was fined $50. "A. A. Knox, representing the company (Key Route), testified that every day about two dozen women of the tribe come to San Francisco, disperse over every portion of the boat to which passengers have access, and by their disgusting conduct and insulting remarks make the lives of the passengers miserable." Another very interesting set of stories in Schwartz's book deals with Berkeley dairies. The Berkeley of 1900 was indeed a place where cows could roam and did. The Varsity Creamery Co. put this advertisement in the Gazette's rival newspaper, The Berkeley Reporter, in December 1906: "Wouldn't you prefer to get your milk from a Berkeley dairy that's removed from its herd every cow found consumptive? The policy of doing just such things has increased our business over 600 percent during the last year." Berkeley dairymen banded together in 1905 to fight a city ordinance regulating the care of dairies and the testing of cows. W.T. Such, proprietor of the Berkeley Farm Creamery, who owned one of the biggest dairies in the East Bay, said he didn't believe in the tuberculin test. "In the first place this tuberculin test, as I understand it, was vetoed by Governor Pardee and in the second place Berkeley is the only town in the State where the tuberculin test will be made should we be forced to comply with that section of the dairy regulations." "A Berkeley Enterprise Strictly for Berkeley People Only Absolutely pure country milk and cream from healthy cows and fed in a well-ventilated and sanitary barn — fed on only the best food obtainable." "Berkeley 1900" sells for $24.95 in Berkeley bookstores and online from Amazon.com. 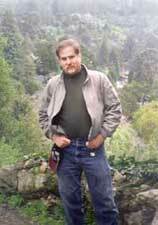 Schwartz will be appearing at Books Inc. at 7 p.m. Nov. 9 at 1760 Fourth St., Berkeley. On 11/5/09, SFGate, the website of the San Francisco Chronicle, posts a photographic gallery of over forty images from "Berkeley 1900."